Customized cases have flexible and essential uses in several assorted businesses. They may be produced into many different sizes and used with custom foam inserts. 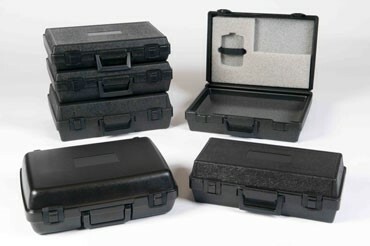 Custom blow molded cases have been useful in transporting important equipment from one location to another. There are several types of equipment that the army must safely transfer. Most of the time, the safe transfer of equipment is for the security of the general public and the personal safety of the military personnel themselves. This includes weapons, significant and necessary uniform features, or other environmental equipment. Military personnel face a range of challenging and unpredictable situations. It’s essential that the gear that they use be able to be transported safely and securely. The custom cases must be durable, able to withstand extreme temperatures, and in some cases, even waterproof. Equipment that is essential for preserving and saving human life is usually sensitive to drops, falls, and the environment. There are cases when equipment has to be transported from one location to another, especially in emergency situations. Custom cases have to keep this fragile equipment safe from being damaged. Custom foam cushioning also keeps functioning parts separated and secure until a professional can build them onsite. Electronics are often fragile and costly. For demonstrations or expos, professionals that work with proprietary and new electronics require a solution that will make certain that the electronics will remain in one piece during transport. This industry would likely get the most use from foam inserts that will pad, encircle, and protect the equipment. Materials like custom foam inserts will continue to keep things shielded while metal inserts can create custom segments where the electronics will sit inside. Tools and building equipment typically come with plastic cases as these keep them protected from abrasion. These items are usually expensive and are essential components to bigger building projects. Not having them available and in working condition can cause losses in productivity and money. They comprise the tools themselves and smaller elements that are utilized to connect other, larger pieces of the structure. Whether you need custom shipping containers or custom shipping packaging, we have the expertise and years of experience to provide a quality product at a price you’ll appreciate every moment. We are exceptionally skilled at creating distinctive and innovative solutions for all industries.